Weak Ceropegia is an erect tuberous herb, up to 15 cm tall. Tuber is 3-5 cm across, depressed spherical. Leaves are up to 8 x 0.4 cm, linear, pointed, base narrowed into a short leaf-stalk. Flower-cluster-stalk is 8-10 mm long. Flowers are greenish, 3-5 together, 3.5 cm long; sepals 4 x 1 mm, subulate, puberulus. Flower tube is 1.6 cm long, dialated below; petals 1.5 x 0.4 cm, oblong, blunt, base curled, eared; outer corona 2 mm across, divided, lobes blunt; inner corona 4.5 mm long, oblong, blunt, fused. Weak Ceropegia is endemic to Southern Western Ghats. Flowering: June-September. Medicinal uses: The tubers are edible and contain an alkaloid called ceropegin and are used in Ayurvedic drug preparation that are active against many diseases especially diarrhea, dysentery and syphilis. The root tuber also contain starch and used as a nutritive tonic and blood purifier. 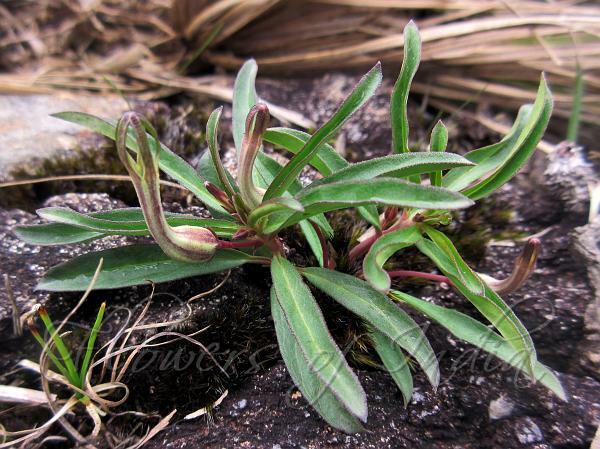 This plant is also used as an antidote for snake bite. Identification credit: P. Samydurai Photographed in the Nilgiris, Tamil Nadu.